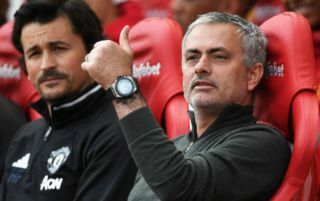 Man Utd face a crunch clash with Chelsea on Saturday in the FA Cup final at Wembley, with both sides desperate to claim silverware to end the campaign. Both sides have disappointed for the most part this season, as while United finished 19 points adrift of Premier League champions Man City, Chelsea failed to even claim a top-four finish. Further, they both crashed out of the Champions League at the last-16 stage, and so winning the FA Cup will be of real importance to both managers and clubs. With that in mind, Jose Mourinho will be delighted as reports claim that Romelu Lukaku, Anthony Martial and Marouane Fellaini, who have all been injury doubts, have travelled with the rest of the squad for the game, as per ESPN. Particularly in the case of Lukaku, who has scored 27 goals and provided nine assists in 50 appearances this season, it’s a huge boost for the Red Devils as they’ll be desperate to have their talisman lead the line against the Blues. As for Martial and Fellaini, they haven’t been able to establish themselves as regular starters this season, but having that depth and different options at his disposal, Mourinho will be delighted that he can call upon different players depending on the situation if all are passed fit. As noted by The Express, there have been doubts over Martial’s long-term future at Old Trafford given his struggles to stay in the starting line-up this season, while Fellaini has yet to sign a renewal with his current contract set to expire this summer. In turn, it remains to be seen whether or not Saturday’s encounter could well be the last appearance for both in a Man Utd shirt.